There is much confusion in the history of the “Company of Santa Maria della Croce in the Temple” also known as the Company of the Temple (now called Company); confusion due to misinterpretation of historical events, the dates and for the liberal use of the names. For the people of Florence is famous the Company de Blacks or Battuti de Blacks or even the Blacks who, however, is a sub-company, as well as the hospital in the Temple and the Buononimi the Stinche, the Society of Saint Mary of the Cross at the Temple. 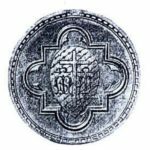 This company has distinguished itself for many charities and for a truly unique birth as well as a renaissance as Arch-confraternity in 1912. The company emblem was, according to the Migliore di Vanni, a red cross on a silver background with a S and M on one side and T on the other. This emblem is still present in the lintel of the door of the oratory and even if worn by time and deprived of original colors you recognize the typical Templar central cross and the letters to the left of the cross have MS and to the right of the cross is the T.
was instead a red Latin inscription on a blue or white, in the middle of a cross in the star field with monograms and SM T, the Latin phrase was “S. Societatis S. Marie de Cruce to Templum flourishing ” (A pag. 8). 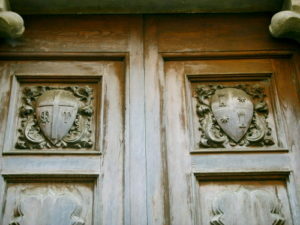 Two carved coats of arms are also present on the wooden door of the Oratory, in both upper lobes. 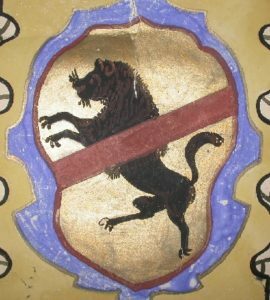 On the left it is represented the emblem of the Society and in the right the emblem of the Torrigiani family. The Company of Saint Mary of the Cross at the Temple was born in Florence on March 25, 1347. The story of the birth is quite unique, due to some of the young men of San Simone People who gathered at the corner of Street de ‘Macci (formerly Street San. Francesco) with Street de ‘Malcontenti (now Street San Giuseppe and first of 1333 Street the tabernacle, and before that the Street of the Temple) in front of a shrine with a picture of the Madonna to sing her praises (A p. 8/9) . Already the change of the name of the streets in time has generated confusion, very important to remember that the original name of Street San Giuseppe was the first street of the Temple. At that time in Florence tabernacles to street corners they were so frequent that there were so many intersections of the streets that they had a religious image, more than those without. Today there are few preserved and each has a story to tell. The Virgin appears to have been granted many graces and in the wake of these were so many people who stopped for a prayer. Likely to have been the desire to give thanks to the Virgin Mary who lit the desire of the faithful youth to come together in a company that could bring in return kindness, prayer and help to those who were less fortunate. 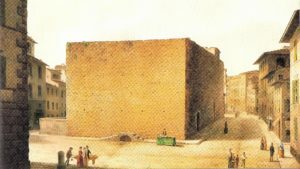 The Tabernacle of the Virgin no longer exists, and some mistakenly believe that it is the Tabernacle of the Virgin or Sant’Onofrio intersection of Street de ‘Malcontenti and Street delle Casine, the tabernacle which instead was erected later. According to the Fioretti (E) the Virgin of the tabernacle which is referred to had to be the Virgin Mary of Giglio which also prompted the formation of the Brotherhood of San. Giuseppe(E p. 87). The Young decided to create the company organized to bring together the funds and among the most noble purposes heard was to erect a place where those condemned to death could pray and ask for forgiveness for the last time before you executed the sentence. They agreed to fee if yorself and set aside 4 denari every week in order to create a chapel and small church near the Meadows of Justice. During their meetings each proposed ideas for my good deeds. Two established themselves more, one alleviating was materially and spiritually the punishment of those condemned to death, and the other lead material comfort and prayer to those convicted of Prison Stinche. The songs and voices of children in front of the Tabernacle were fighting in penitence very attracted the people by increasing the number of members of the Company that was enriched not only the youth but also of adults. At the same time they increased the alms and donations information the good intentions of the members (A p. 9). The company grew so much as having to gather under the arches of the Santa Croce Church (on the side of Street Largo Piero Bargellini), it is said, referring at Santa Maria Maddalena (ed. Maybe means the Rinuccini Chapel, which is consecrated to Maria Maddalena began to build in 1333) (A p. 9). Under the vaults of Santa Croce he was drafted the first statutes and elected the first mayor of the Company; the statute was enacted that their main officio, but not unique, was comforting the offenders sentenced to death and bring them back to repentance. It was also decided to set up a hospital, to visit the charity to prisoners Stinche and assist women in childbirth (A p. 9). Because of the plague that was sweeping Florence at that time only 10 May 1355 were approved the statutes of the Company by Matteo da Narni vicar of Francesco Bishop of Florence. Subsequently approved in 1366 by Cardinal Pietro Corsini Bishop of Florence and finally approved in 1369 by Pope Urbano V that enriched them with privileges and indulgences (A p. 10). The era statutes have been lost, but Uccelli (A) in his book on page. 33 to p. 58 shows the chapters of the statutes drawn up by Benedetto Uccelli and taken from Code 43 (editor’s note: or 45), Cl. VIII Magliab (editor’s note: Magliabechiana Library). The company took the name of the Company of Saint Mary of the Cross at the Temple. The name was not invented and discussion about its origin involved in all subsequent authors in assumptions and especially confusions. Before illustrating the hypotheses sustained by the various authors and to draw conclusions, I should mention that the whole area that stretched from Santa Croce to Piazza Piave was called to the Temple and that some claim this name is due to the presence of a great Temple Templar identified the original site with the Pazzi Chapel. This indeed support the Templar presence in the area in question and thus the real possibility of the presence of a hospital run by the Templars. The fact that this area would identify as “the Temple” is also written dall’Uccelli citing a provision of the lordship of 30 June 1318 in which you sort of end the Prison Stinche area indicated as the Temple (A p. 8) . All tend to be in agreement that the first part of the name came from a hospital this in via de’ Malcontenti (shown near the San Francesco’s door), which in 1332 was directed by Sor Giovanni. Hospital called precisely of Sant. Mary of the Cross. Some suspect that this hospital was outside the walls and run by the Knights Templar, a hypothesis at least as strange place a hospital outside the walls was quite risky. In fact, as we shall see later, this hospital was situated in the Street San Giuseppe between civic 12 and 14. The part of “the Temple” is rather uncertain in its origin and has multiple versions (A p. 7). These versions provided by different professors. A first version has it that “the Temple” comes from the fact that the area chosen to build the church likely the last prayer of the condemned and their subsequent burial was erected outside the walls to the Meadows of Justice (editor’s note: Today Piazza Piave) . The site in question was outside the Porta San Francesco, or the Gate of Justice (editor’s note: in antiquity also called San Candida gate) behind the fortification walls and it seems that in that area there was a temple dedicated to idols and from this derives the choice Temple. Even today there is the Lungarno del Tempio that Piave Square heading down to da Verrazzano bridge. This is the version to be believed Tozzetti and Targioni and also dall’Uccelli (A) (B p. 28). This version seems unlikely, however, it would be the first case and there never would have been a similar case, in which a company takes a pagan religious denomination. 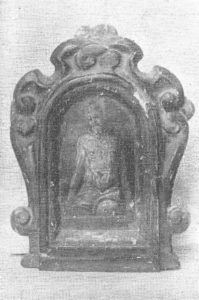 Also remember that the current Via San Giuseppe was then called away to the temple that would have greater sense indicating “the Temple” in the name of the company to its real location. A second version has it that the words “the Temple” was derived from the nearby Church of Santa Croce and D’Indico (C) it has supporter stating that even the nearby Convent of San Francesco in the homonymous street (today de ‘Macci) was named S. Francischi Templo de Maccis (C p. 4). This version seems unlikely if not in the fact that the whole area, as mentioned, was called to the temple. A third version has it that there was a hospital outside the walls near the gate of San Francesco temple belonging. Pending resolution of the Jesuit church building appears to have been used, temporarily, for the last prayer of the condemned the chapel of the hospital Templar and hence the name “the Temple.” But there is a contradiction in dates in fact we know that the Templar order was abolished by Pope Clement V in 1307 and is therefore unlikely to be used was the chapel of the hospital in question from the company that came into being in 1347. Having said that this reconstruction can take on different meaning if you consider the location of the hospital out of the wrong walls, and the right to its actual position in the street of the Temple of the time. We come to the fourth version, perhaps more likely, obtained by us from the interpretation of the various versions. The first and main headquarters of the company was the Oratory, which still exists, in street San Giuseppe. As I told you consider that at the time this stretch of street is called de ‘Malcontenti and before that was called street of the Tabernacle and the Temple street before. The ancient name of the street of the Temple comes with a good chance that it was the street that from the city, walked out the door, reached the great pagan temple outside the walls. The current Oratory in that street was probably Templar hospital and with very good chances remained free after 1307 was entrusted to the Company formed in 1347. This is supported by the Fioretti (E) which said in a statement on his book on p. 59 that a code of Lami nº3212 fasc. V nº 29 we read these words “Xenodochium Sanctae M. Temples, pro pauperibus mendicantibus. Haec olim erat Mansio aequestris Ordinis Templariorumquae nomen adhuc retinet Temples “. So it can deduce that the hospital Templar was not outside the walls of Florence but within the walls and where could it be but in a street dedicated to the Templars themselves, precisely street of the Temple. 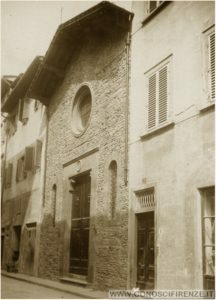 always also the Fioretti (E) states that the headquarters of the Company was a chapel or little church situated in street de ‘Malcontenti between street de’ Macci and street of Pelacani (today street of the Conce), near the Church of San Giuseppe, an ancient structure with a canopy (note: overhanging roof) above the door (E p. 75/76). This would also explain the presence of the Templar cross included in the emblem of the Society maybe to pay homage to the place that housed the Company itself. The hospital was called St. Mary of the Cross with the words to the Temple due to the way the Temple location. The oratory, now deconsecrated, has always had the same name even before the formation of the Company, Oratory of Saint Mary the Virgin in the Temple of the Cross and is the company that takes the name without the suffix Virgin. This change, too often misled so that the same City of Florence gives wrong information of name and historical data. This little church, an oratory, held the private church function as pertaining only of the Society as a place of assembly and prayer, and in the early days, before the construction of the Temple church outside the walls, even the last place of prayer for those sentenced to death. Thinking in these terms because it also includes the management of a hospital in the pious work of the Society has been included that were to handle their own space that once was the hospital Templar. Finally, the official seat of the Company was the current Oratorio is also the unanimous Hats (B p. 35) which highlights how inadequate was the little church in the Temple (completed in 1366) for meetings and prayers of the Company and for the size, and because did not exist at the birth of the Society, and the fact that he was outside the city walls, dangerous places; the meetings were bound to play within the walls. Different roles on the church yet to be built outside the walls. A small advance, to dispel any other concerns, church outside the city walls, seat of the last prayer for the condemned has always been called the Temple. These uncertainties on the Company’s behalf, based on the first and on its name and location, the fact that the church was built later called the Temple, the wrong position set out for the hospital Templar, the fact that the road was originally called to temple and so had indicated throughout that area town have created great confusion which then is poured forth in books and in the following articles. The Company’s organizational structure is much changed over time since the charities increased both in diversification activities both in the field and needing so new people who adoperassero in appropriate sub-companies, this has led to subsequent amendments to the Staff Regulations. The first changes date back to January 27, 1442, then a new reform of the same 26 October 1488. On 20 January 1572 by the Grand Duke Cosimo I were elected reformers that would improve the statutes of the Company of Santa Maria della Croce al Tempio (A p. 20/21). Although the Company was, in it there were the divisions caused by the division of tasks and for the performance of good deeds. These components still referring to the Company of the Temple enjoyed a good autonomy (A p. 18). The brothers were heterogeneous, the Company was composed of noblemen and professionals but also of artisans and shopkeepers, and despite the difference of social classes the work was done in function fairness. The brothers came from all the various Florentine districts and also from areas outside the walls. In the first years of activity of the Company they were elected every six months six captains and a number of councilors and officers. Everyone, every two months, they gathered at the Oratory to decide the offices to accomplish. Every 5 years was carried out a census of members of the Company (A p. 18). The “Buonomini the Stinche”, the “Company de ‘Blacks or Battuti Blacks”, who was in charge of the management of the Hospital of the Temple, which was headed by the “Spedalingo”. Then there were other figures such as the Directors, Superintendents, two people with the task of Masters of Novices and others with various tasks. The Company elected to draw four people called the “Buononimi the Stinche” which were responsible for managing the pious work at the prison of Stinche. At the time the prisoners were living in deprivation and hardship, and only those who could afford to pay obtained better treatment, those who had no economic wealth was left to itself. Together with Buononimi the Stinche lent alongside service of the Company other 4 men chosen to spread by the Grand Duke merits. The Florentine prison of Stinche stood in place of the Teatro Verdi and occupied the entire block, even the way today behind the theater is called “Island of Stinche”. The Conpany through Buononimi the Stinche tried to alleviate this suffering, lending his work in prisons that is provided in addition to spiritual assistance also material assistance to prisoners. These brothers were responsible for administering donations and bequests that were from kindhearted Florentine and used the money to improve the food and for the medical treatment of prisoners. The admiration of the Florentines did their take on over time so much authority, even he was allowed to choose between the prisoners for debt for people who could be released, released from captivity, with a promise to ensure if your debts by rei contracts were properly rewarded, taking then a role of guarantors (a page 17). In 1428 the Florentine Republic authorized the Company to hire staff that Buonomi the Stinche could use in prisons to improve their pious work; They were invited to be a doctor, a chaplain, a caretaker and a barber (A p. 13/14). This meritorious work, carried out with diligence and dedication made the company so well-liked by the people to lead the Republic to issue public subsidies amounting to 112 florins a year that were integrated to donations and bequests to the Florentines. Some of these donations are reported as that of Michele Donato pianellaio that April 28, 1413 he left office at the hospital of Santa Maria Nuova for every March 25 had to provide two loaves Staja facts and a barrel of wine to the Company which turned them to prisoners of Stinche and in case of lack Santa Maria Nuova lost the right on a farm in val di Greve (a p. 13). The “Beaten Blacks” were those who took care of the spiritual and religious comfort of those sentenced to death. Were characterized by the use of blacks clothes and a cap, also black, dropped on the head in order to conceal the identity, those He performed a good work did not do it for personal gain but for Christian charity and this was law for Blacks. Black This dress was marked by a red cross on the front that extended over the chest and abdomen. To consider that at the time justice denied to those convicted every thought and also any kind of sacrament, not only in life but in death also depriving them of a decent burial in consecrated ground, the bodies were simply dumped in mass graves if not sold for scientific research (A p. 10). For the Company this lack of sacraments that riconducessero the offender to repentance in God’s grace were intolerable and their commitment to make the last hours of the less harsh, and sentenced him closer to God were commendable. The April 28, 1356 the Company de ‘Blacks, for the first time, he stayed awake all night and buried after running an executed. A Riccardiano code tells that the post procession condemnation, with Blacks in tow, passing with the wagon carrying the corpse in a narrow lane between the gate and the Guelph Gate of Justice had an accident due to the runaway horse, perhaps for the crowd, He reared. Despite the many people present there was no harm to anyone except for the beheaded corpse fell to the ground (A page 10). The episode seemed ominous for the Company but persevered despite winning the popular buzz over time the applause of the Florentines. 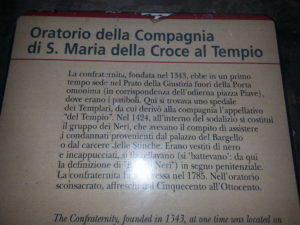 The Compagnia de ‘Blacks within the Company of Saint Mary of the Cross to the temple, however, was officially established as a company in January 27 1442 reformed later on October 26 of 1488, and then definitively on 20 January 1572 by Cosimo I. The service de ‘Blacks began when the Magistrate of Eight condemned to death a prisoner. The judgment was sent to the place of detention that could be the Bargello or even jail Stinche and was also delivered to the Company de ‘Blacks at the Oratory of Santa Maria della Croce Verigine the Temple. A servant received the notice went from shop to shop and house to house to warn the brothers suplizio imminent. The confreres of the Company de ‘Blacks were preparing with the black robe and funny sit well on the head and face and gathered later in the chapel of the Bargello that is the Chapel of Mary Magdalene or the Chapel of the Podesta was also conducted where the offender. The Blacks informed him whether the death sentence is the method to execute him. All night comforted him by the hour shifts, invited him to repentance and confession (A p. 18). Not only was operating a spiritual love but also material by liquor or candy confetti type or other, make quiet the body to recover the spirit. The sentences could be carried out both at the Bargello, usually with the cut of the head, is the Meadows of Justice, usually by hanging, but also to the squares or streets of Florence. Whether the sentence was carried out at the Bargello that outside the walls, the aim was a spectacle the event, in fact, performed the judgments in the Bargello to open ports in order to make them a warning to the people or even to streets and squares in a way that everyone could assist. Execute the sentence at the Meadows of Justice allowed the containment of a large crowd and made the spectacular run in his warning. An hour before the judgment, the sound of the bell Montanina ie Bargello bell warned the Florentines imminent execution. Spiritual assistance and de ‘Blacks material lasted, if the judgment was not performed at the Bargello but to Meadows of Justice, all the way until the condemned to the gallows. It formed a procession formed by the cops and Blacks followed by the population and the condemned man was accompanied to the place of execution; the brothers on the way they recited the psalms. The procession lingered in front of various shrines and the last stop was at the Temple Church, outside the walls, where offenders were receiving the last sacraments before being conducted before the gallows where the Blacks were asking prayers for the soul of the condemned. Until the church to the Temple was not finished the final stop took place at the St. Joseph Oratory in the current street. “The men of whom (Company of the Temple) as it hath been the commandment of the soul to anyone who ought to be executed, they go to comfort him all night, and the day to accompany the use of beaten, glue tavoluccia in hand, always comforting. “(A p. 6). The work of the Brotherhood did not cease even after execution but continued even after as they were provided to bury the executed (A p. 18) that occurred at the Church of the Temple cemetery. Just this Christian charity, and for the black appearance and gloomy Florentines were familiar and very much appreciated Blacks who became so famous is misleading about being an independent company and not part of the Society of Saint Mary of the Cross at the Temple. This solemn commitment in time became the primary charity of the Society, even with the approval of the Cardinal Pietro Corsini of the 1360 statutes by this work of material and spiritual assistance of offenders became even statuariamente the prince of the Company purpose. To remember that among their clients Savonarola was also there that in 1498 imprisoned in the tower of Arnolfo in Palazzo Vecchio was comforted by Jacopo Niccolini part of the Blacks. The path of those sentenced to death to the place of the executions was the same for several centuries. The procession made by the cops and the Blacks started from the Bargello and traveled street Dei Leoni entered the street de ‘Blacks, svoltava to the left to reach Piazza San Remigio, continued in street Magalotti to turn right in Borgo de’ Greci and from which accessed at Piazza Santa Croce that traversed its entire length led the procession in Largo Pietro Bargellini who then became street de ‘Malcontenti up to the ancient walls. Today the stretch from Largo Bargellini in street de ‘Malcontenti called street San Giuseppe. 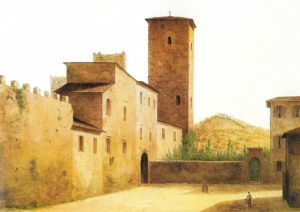 The procession went out of the city walls of San Francesco gate, or also known as the Gate of Justice, by accessing what is now Piazza Piave and who at the time was known as “Meadows of Justice” where the scaffold was erected and completed the sentence by the executioner. The space at the Meadows of Justice lent itself very well for capital punishment because it allowed the population to assist in the event ground. The Florentine tradition of hanging executed to death on the wall of the Bargello as an example for the people went into the ritual of the path of the condemned along the Florentine streets and then in spettacolizzare the event to “Meadows of Justice,” always with the aim of making public and warning justice itself. The last stretch of the trail explains the name of the street that precisely de ‘Malcontenti as it was the last leg path by those who were going to die; the road at that time was characterized by the presence of a hospital and an orphanage, just as places populated by people not happy. 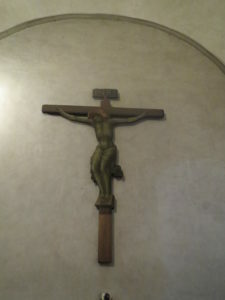 At the head of the procession that accompanied the detainees was used a crucifix which is now preserved in the Church of San Giuseppe. Of the many members of the Company only a few were allowed to comfort the condemned to death, and their names had to remain secret worth the expulsion, for this reason, covered their faces with black hood. The hood had indeed intended to hide the identity of who He performed good works. From this ritual aspect derives the name that was popular in terms assigned to the brothers, “The company of ‘Blacks” or even “Beaten de’ Blacks’ in that it was a ritual that hooded accompanying executed at the gallows is chattering with a tavoluccia in a sign of penance (a pg. 6). In 1368 the Company began to draw up a register of convicted assisted where were noted not only the names but also the burial places of the condemned. In 1408 Captain limited to 12 the number of Blacks and then in 1423 it doubled the number as 12 were insufficient. In 1442 he came to credit 50 brothers in this role (A p. 19). From 1420 the register where the condemned and burials are noted is drawn up by Giovanni d’Andrea di Lorenzo Sommaia (A p. 19). In 1477 the priest Amedeo Amedei imposed a perpetual tied to the rector of the Chapel of San Giuliano Church of San Niccolo, who was assisting the condemned man and let him have a sweet bread 3 oz done by the nuns, practice a few years later fell into disuse . Chaplains of this church were also elected by a vote of the Compagnia de ‘Blacks; to remember as chaplain Lorenzo Grossi who left the memory of those executed by him assisted the adjuster from May 6, 1661 al 23 July 1695. Also in 1477, on August 1, Pietro Gianni Cardajolo paid 70 gold florins to set up cabinets and sink at the church in the Temple (A p. 15). 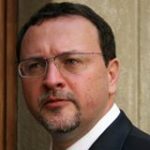 May 20, 1503 due to a poorly run made by the Executioner in Jerome torture of Girolamo Sandro a stone-throwing by the people against the Executioner who was killed, the stone-throwing in danger of unwittingly engage even the components of the Company. 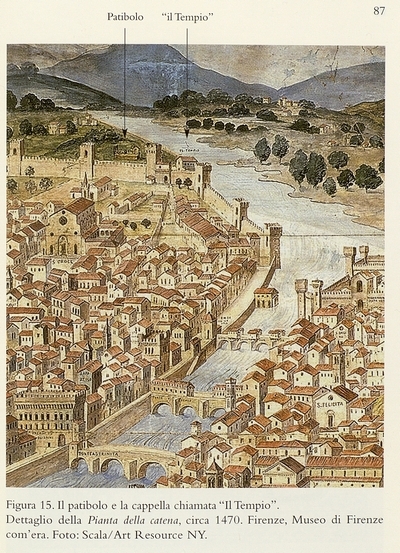 The Company Register kept was damaged by the flood in Florence in 1557, though it managed to make a copy. Thanks to this register now know many details about the convictions of many celebrities and not. In 1558 La Compagnia de ‘Blacks was twinned with that of Misericordia in Rome who was in charge of the same tasks (A page 24). Cosimo I January 20, 1572 elected the reformers to change the statutes of the Society of Saint Mary of the Cross at the Temple. The reformers were: M. Marco Giovanbattista degli asini, M. Vincenz0 of Niccolò Godemini, Benedetto of Giovanni Covoni and Benedetto of Jacopo Antonio Busini. In the new statutes it was defined the new structure of the Company that would be led by 9 Captains, 3 elected in the district of Santa Croce and 2 for any other district. 12 people would be part of the Compagnia de ‘Blacks and were to be families who had enjoyed the Gonfaloniership of Justice or the Priory, were called it “Beneficiati” and 38 others could be noble or popular, but the family had to live in Florence or in’ immediate suburbs, and all had the specific purpose of assisting those condemned until the time of their execution, all are equaled within the Company de’ Blacks. The Company de’ Blacks depended entirely on the Company of Saint Mary of the Cross in the Temple and every bequest or donation had to be turned to the mother company. Some monasteries were aggregated to the Company de’ Blacks so that they were warned of the imminent execution of an executed and therefore could sing the prayers for the same (A page 20/21). It would be nice to dedicate an entire chapter to his devotion and patience of ‘Blacks during their office here, as did the Hats (B), but I prefer to postpone the reading of this rare little book to appreciate the narrative. 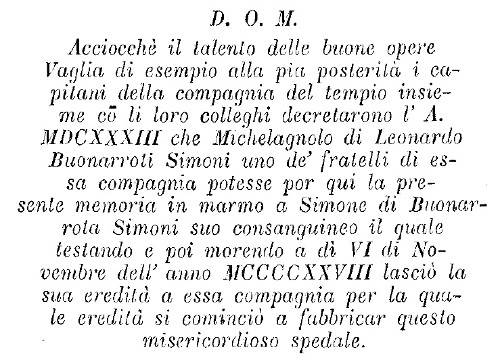 In 1428 at a cost of 300 gold florins he had inherited from Simone Buonarrota it is opened (editor’s note: or perhaps I should say re-opened) in street De ‘Malcontenti a hospital by the Company. 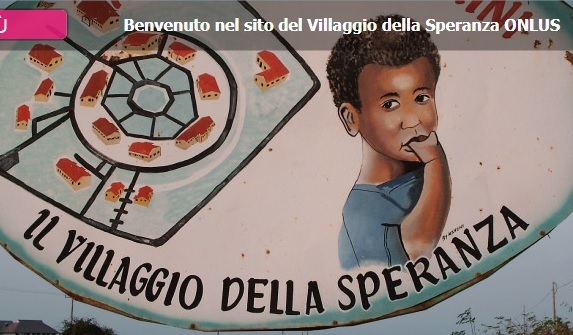 Among the officers he was elected one “Spedalingo” who ran the hospital along with eight nurses and paciali. Of this hospital I would not remember if it was in 1633 the young Michelangelo Buonarroti had not affixed a plaque visible today inside the Oratory of Saint Mary the Virgin in the Temple of the Cross (A p. 12). The same plaque testifies that the purpose of the Company was purely aid and is affixed inside the Oratory since the same was part of the hospital complex that seems to be extended to the houses to the left of the Oratory and it seems that the kitchen was all ‘ angle between street de ‘Macci and street San Giuseppe (B p. 40). The total area of the hospital had to be quite extensive both laterally and vertically, much more dell’Oratotio himself who very likely was the original hospital Templar. From 1356 to 1575 they were made many donations and bequests to the Company to use for the ‘hospital and the pious works toward the prison prisoners Stinche. food and spiritual liturgies goods for prisoners and medical care for the indigent were financed with this money (at p. 13/14). All these functions have been reported accurately in the records from 1356 to 1575. I particularly remember is the donation made by Niccolo di Ser Vanni, pariahs to 534 ducats in order to maintain a chaplain who was elected with one vote of the Vanni heirs and two votes, one of the Captain and one of the Company’s Auditor, which was probably chaplain planted on the top floor in the current street St. Joseph 12 (B p.41). In 1751, the hospital of the Company was suppressed and transferred to Bigallo and along with it also the oratory and all appurtenances, including the house inhabited by spedaligo the corner of the street then de ‘Malcontenti and street de’ Pelacani (A p . 14/15).